Jenny Slate is the Muppet Babies' Nanny, But Why Has Skeeter Been Erased From this Narrative? “I was... so excited... when they asked me to be Miss Nanny,” says Jenny Slate, with a convincing amount of enthusiasm, in this “featurette” about the making of the nightmarish Muppet Babies reboot coming to Disney She really does sound excited, but I don’t know if she should be. Deadline reports that the voice of “Miss Nanny,” an iconic pair of legs in striped stockings, will be voiced by none other than Jenny Slate, whose enthusiasm for the role is quite charming. The original “Miss Nanny” was voiced by Barbara Billingsley of Leave it To Beaver and despite the rumors that may have floated around your schoolyard, she NEVER bent down and revealed her face! She was always, always wearing striped stockings and sensible Mary Janes and DO NOT listen to conspiracy theorists that would tell you otherwise. Anyway, it’s great that a new generation of children will be able to experience the joy that is Muppet Babies, but I’d urge you to take a look at this featurette and let me know if you don’t feel a chill deep in your bones at the look and feel of the whole thing. It’s not immediately clear to me why the show is now taking place in a pediatrician’s waiting room and not the friendly, cluttered nursery of the original, but such is the nature of children’s programming today! The CGI is cold and unfeeling and places what was once familiar now resides firmly in the uncanny valley, but that is neither here nor there. 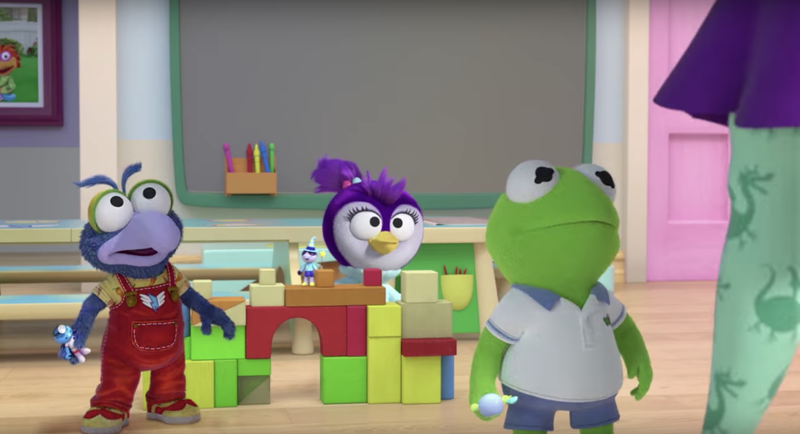 My issue with the new Muppet Babies—which I’m sure will be just fine—is twofold. First, could someone tell me who this penguin is and why? According to EW, that’s a new character named “Summer”—funny name for a penguin, get it?? She was added because Miss Piggy needed a female friend. She’s purple, she’s wearing a turtleneck, she’s very cute, and will likely look great on lunch boxes, backpacks, thermoses, and whatever else it is small children carry on a daily basis. It’s quite dark to introduce a new character in a prequel that has no adult equivalent; there’s a grown version of all the other Muppet Babies, but how will they explain the puzzling fact that Summer never made it to adulthood? Did she move away? Was she killed? Was there an accident on the swing set? Will we ever find out? If you recall the original cast of the Muppet Babies, surely you remember Skeeter and Scooter—brother and sister, with orange hair and light ochre bodies. They were fun... and they’re not in this iteration, erased from this narrative for reasons unbeknownst. While Scooter is an adult, Skeeter’s absence from the Muppet canon has been explained in a way that I find less than satisfactory: according to Scooter, she’s “studying overseas.” Sure. Whatever. But wait—what’s that picture on the wall? Is that... hmm. AHHH IS THIS A MEMORIAL?? If you’re not going to include two iconic characters in your reboot of a beloved classic, then it feels RUDE to their legacy to put them in a strange framed photo that suggests rather than confirms that they existed in the first place. Maybe Slate’s “Miss Nanny” will cover that when this show premieres.